Hello and welcome to my profile! 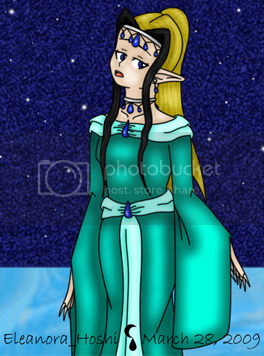 I am the Elf Princess Eleanora Hoshi, but you can just call me Ella. I tend to disappear from websites and then randomly reappear a few weeks or months later... Not my fault! Not only do I have random distractions, but I've been very busy with work and school. Can't wait for summer break so I can get back to working on art projects instead of school ones. ..::.. My Bestest Best Friend's Profile ..::.. My Best Friend's Profile ..::..
..::.. My DragonCave Scroll ..::.. My DeviantART ..::.. My GaiaOnline Art Shop ..::.. My GaiaOnline Pixel Art Shop ..::.. I might make items every once in a while, but I won't be able to take any requests. Made by my best friend, Soryko. All the rest of your hair looks really good. Aw come on, you can't give up! You've done all the elemental hair here, you can't just let someone else take it. I was just talking about the hairline, I have nothing against magma. Maybe you should redo it when you feel more like it. Making items should be enjoyable! It's no good compared to other submitted items, so no one uses it much. x"P I think? And I love the hairs you made, too. I will admit. I think the one side is a tad too fat, but it works. They should be accepted this time. I didn't feel like adding em lol. She said thank you, and then I said your welcome. then she asked how I was. I said good, how are you? Then I said in Japanese that I only speak a little Japanese. xDD But it turned into symbols all the sudden loll.